We’ve remarked before on the glacial pace at which newly acquired public lands are opened to the public in these parts, so we’re glad the Forest Service has taken the first step toward genuinely opening the Brazil Ranch, purchased almost a decade ago. That step has been to open a trail from the entrance road to the top of Serra Hill, and a trail poison oak infested bush whack from the road to a point overlooking Bixby Bridge. In our tradition of checking out newly opened areas and trails, we went and took a look. 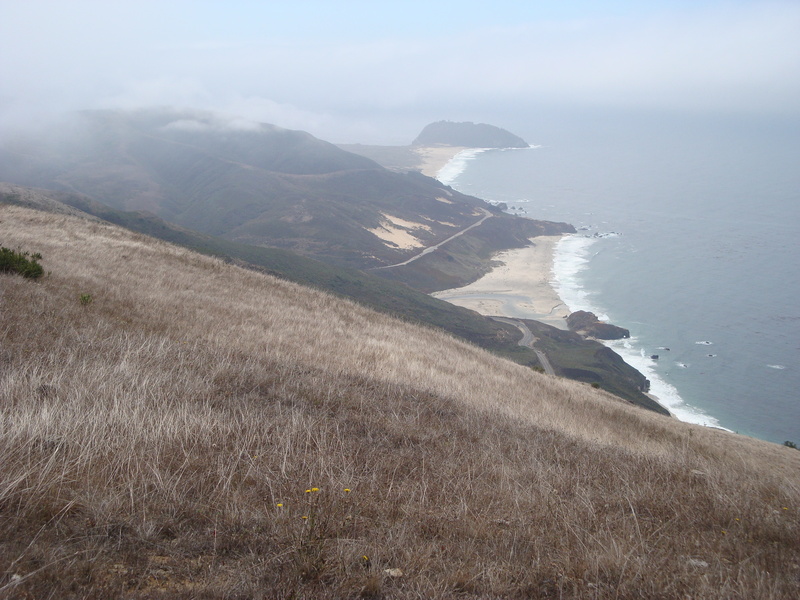 Serra Hill, mislabeled “Sierra Hill” on many maps, rises abruptly out of the ocean just north of the mouth of the Little Sur River to a height of 1,545 feet. 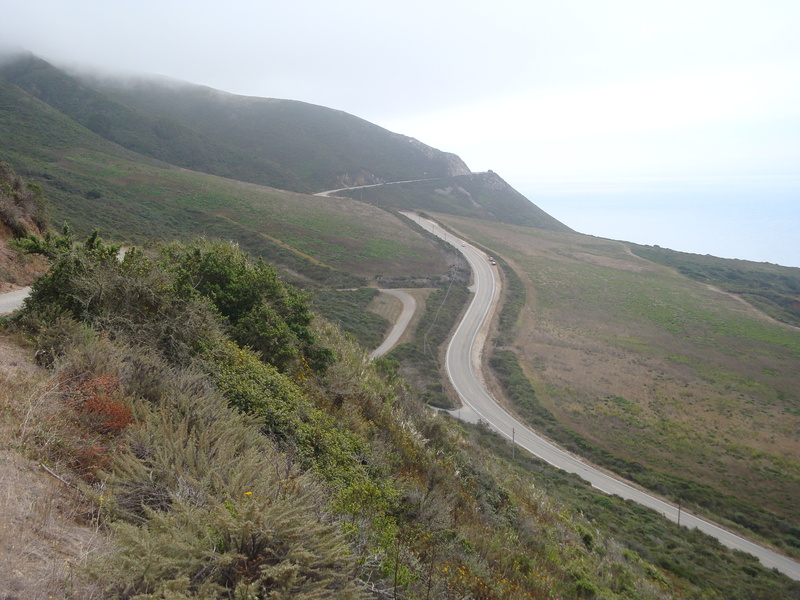 It rises so abruptly that no one even attempted to force a path along its ocean side until the building of Highway One in the 1930s – and it remains one of the most landslide-prone and problematic stretches of the Highway. Serra, as explained at length in Clark’s Monterey County Place Names, does not refer to the genocidal mission-builder, but is a corruption of the Spanish word, Cerro, meaning – appropriately enough – “high hill.” So perhaps, in the local tradition of combined Spanish and English place names (like “Big Sur”), we should be calling it The Cerro. 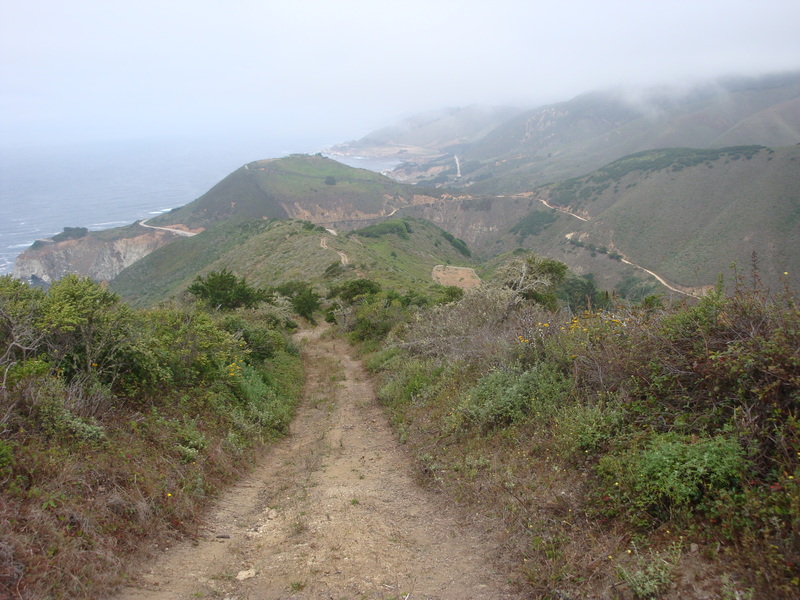 To climb the Cerro, park along the side of Highway One about half a mile south of Bixby Bridge and walk up the paved main entrance road to the Brazil Ranch. Just past the top of the ridge, you’ll come across this sign. Go right, up the hill, to climb the Cerro. Go left, off the other side of the road, to get tangled up in ceanothus and poison oak (more on that later). The route follows an old ranch road straight up the ridge. It’s steep, with many false summits. This is a view to the north from about half way up. Trailside wildflowers are abundant even in September. 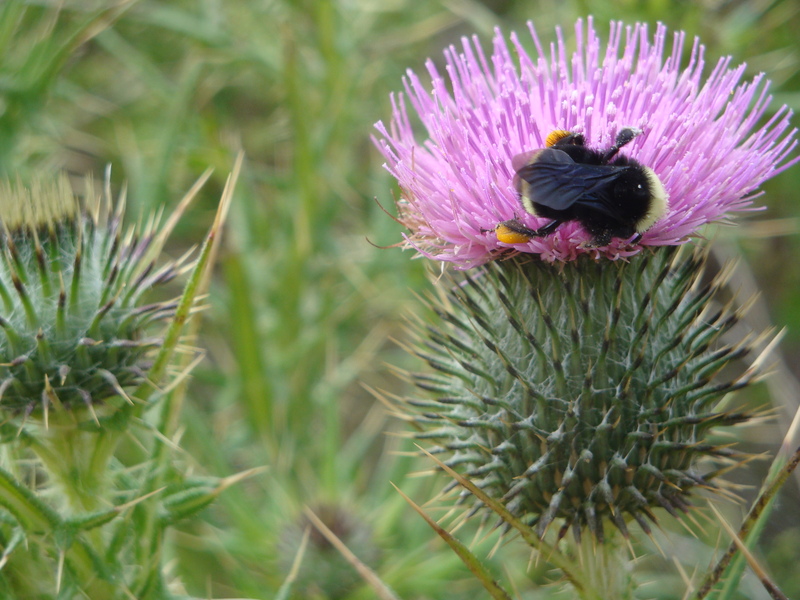 A bumblebee gathers pollen from a thistle. After reaching a gate that must be climbed over (Pro tip: the fence to the right of the gate is easier to climb over than the wobbly gate), the climbing eases and the trail (road, really) reaches a rolling grassy ridge. This is the view of Pt. Sur and the mouth of the Little Sur River from the high point along this ridge. You may be tempted to think that this is the top of the Cerro (and it is, according to the USGS, only 18 feet lower), but the true summit lies ahead. View of Pico Blanco and Post Summit from the real high point of the Cerro. To reach it continue on the road until it reaches a fence and gate. Take a well-defined trail to the right, keeping on your side of the fence and the high point will be reached in a short distance. 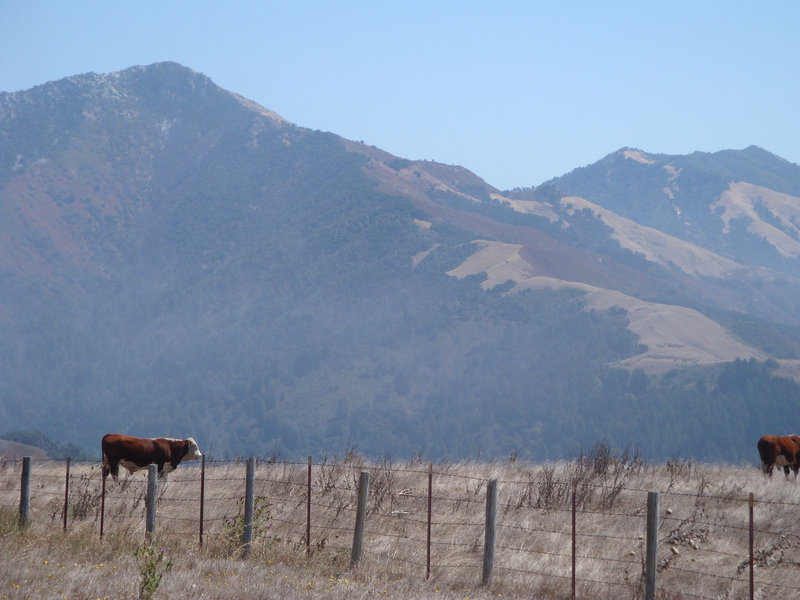 Don’t worry about not recognizing it in the fog (it’s usually fogged in up there – in fact, the Cerro is one of the foggiest spots on the entire coast). You’ll run into more fences (as pictured above) when you reach it. The entire distance from the paved road can’t be much more than a mile. Bixby and Uncle Sam Mountains. Uncle Sam rises at the back of the Little Sur drainage on the divide between the Little Sur and Carmel River watersheds. It was not patriotic fervor that gave Uncle Sam its name. Instead, as noted by Clark, it was named for “an old Mexican pioneer” who went, for reasons unknown, by that name. Some kind of Stephanomeria??? blooming near the summit. After returning to the paved road, we take a look at the “trail” to the left. 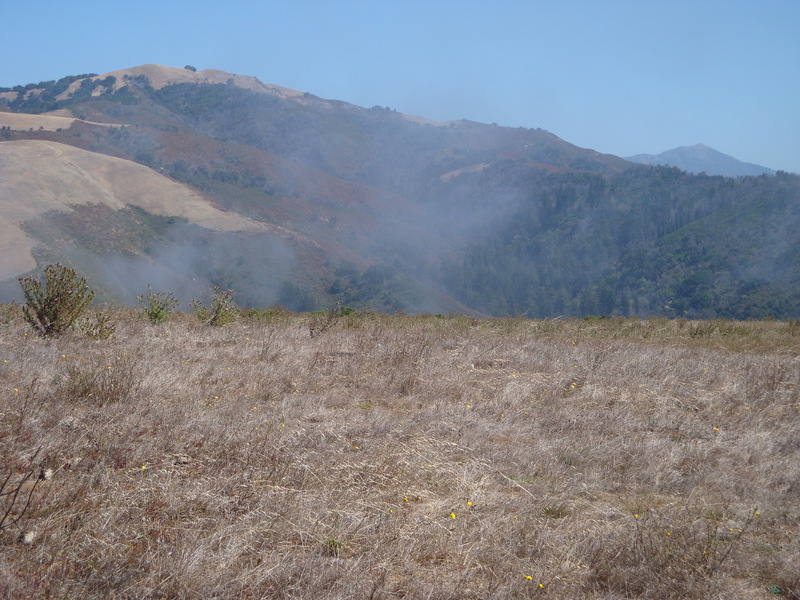 It’s supposed to follow this spur ridge out to something the Forest Service calls “Prominence Point,” with a view of Bixby Bridge. Do you see a trail along this ridge? Neither do we. That’s because there really isn’t one. View of Bixby Bridge from Prominence Point. To get here, start down the ranch road in the direction indicated by the Forest Service sign. Ignore the less brushy routes that branch to the right and left and plunge straight ahead into the forest-like thicket of ceanothus. You will have to bend way over to get under the branches and poison oak will be brushing your ankles, but this is just the beginning. 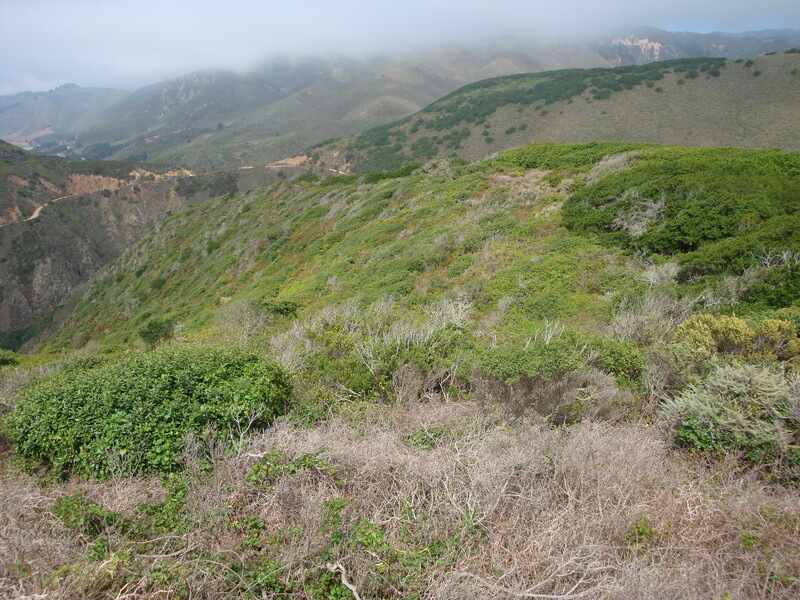 As you emerge from the ceanothus grove (where a deer we startled actually screamed at us) the way looks easier at first, but soon degenerates into higher poison oak and ceanothus that cannot be ducked under, but must be forced through. Fortunately, the “Point” is reached in less than a quarter mile. We have to admit to being somewhat puzzled that the same Forest Service that closed the entire Ventana Wilderness for almost eleven months because they were worried the trails might not be safe enough, has here put up a sign directing wanderers onto a poison oak choked bushwhack to the edge of a cliff. Prominence Point itself is a kind of scruffy flat that looks like it might once have been a helipad. 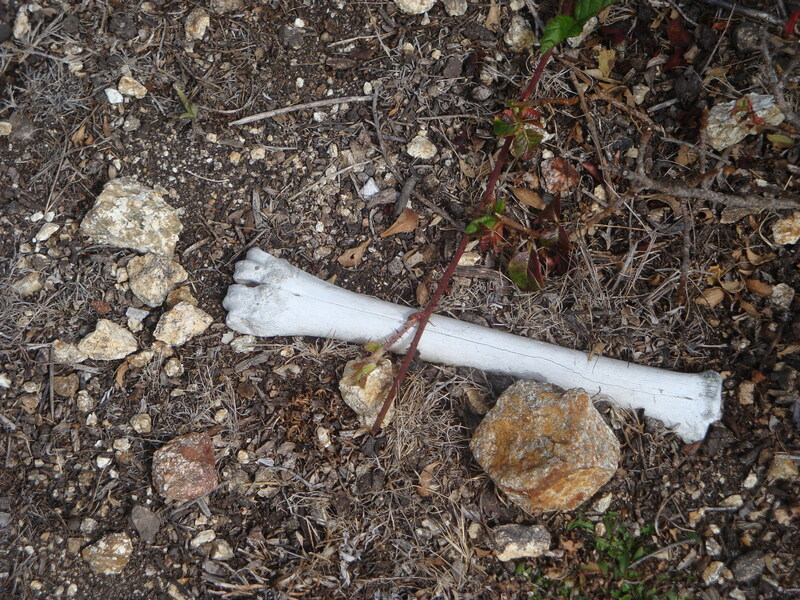 As pictured above, it is liberally sprinkled with bones – giving it a decidedly somber atmosphere. 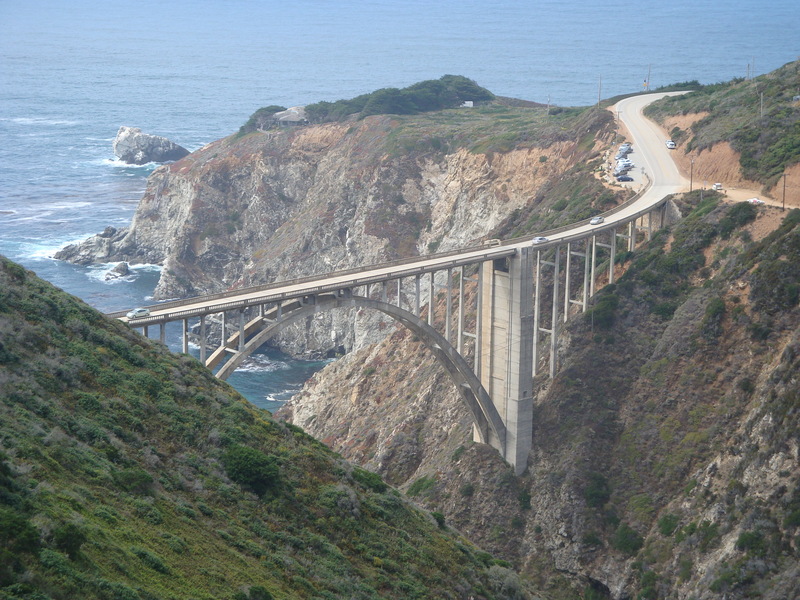 Until a real trail is cut, most travelers will, no doubt, prefer to view Bixby Bridge from other vantage points. Returning down the Brazil Ranch road to the Highway. Hurricane Point, where the Highway crosses one of the Cerro’s most prominent limestone ribs, in the background. 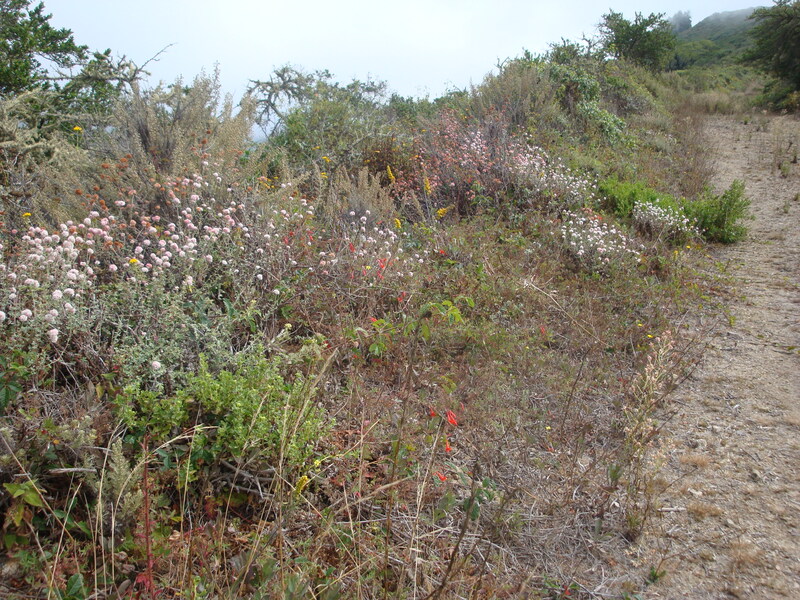 This entry was posted on Friday, September 16th, 2011 at 5:42 pm and is filed under Big Sur, On Foot, Plants, Santa Lucias, Wildflowers. You can follow any responses to this entry through the RSS 2.0 feed. You can leave a response, or trackback from your own site. 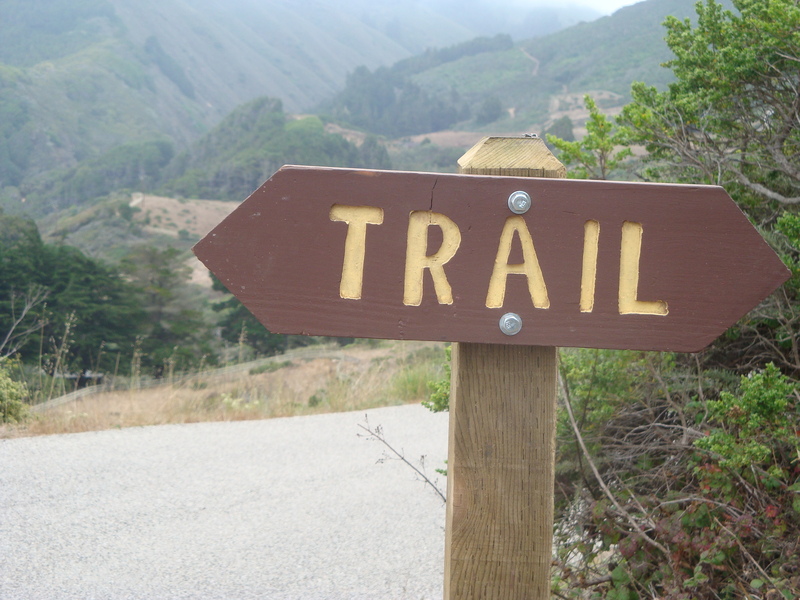 Thanks for your on the ground trail reporting. I tried last week to bushwhack out of Hare cyn trail to hook up with the Vincente flat trail all on maps and gave up after 2 hours. Happily, i soaped and washed up enough to avoid being infected with the poison oak all around.Keep us posted. as per usual, your fingers are on the pulse. 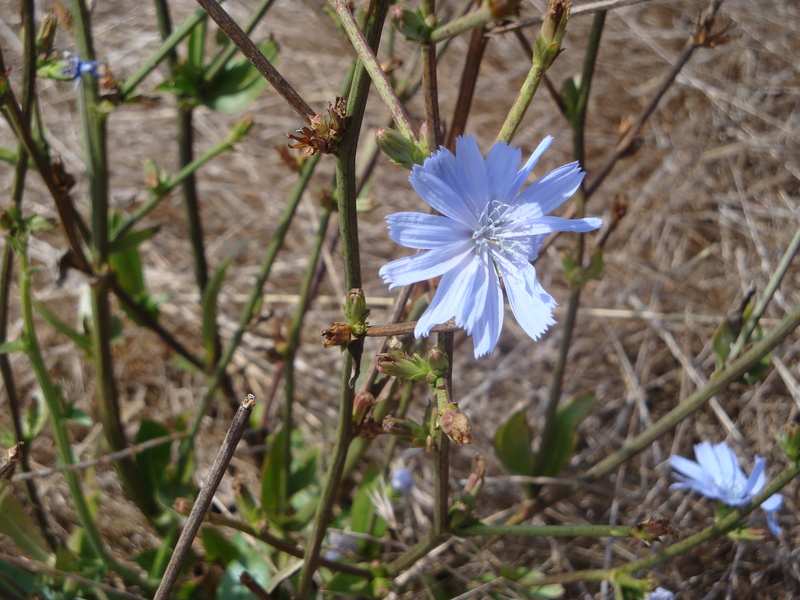 PS- Could your chicory be (naturalized) Cichorium intybus? I’m sure you’re right. Guess I should have added it to my coffee.